HOLLYWOOD, Calif. (July 11, 2017)—Fender Musical Instruments Corporation (FMIC) today announced its collaboration with three-time GRAMMY® Award-winning and multiplatinum-selling country music superstar, singer, and celebrated guitarist Brad Paisley for his own artist signature guitar: the Brad Paisley Road Worn® Telecaster®. Fender and Paisley united to create a classic and timeless guitar reminiscent of one of his prized instruments in his guitar arsenal, his silver sparkle Telecaster®. The collaboration will be officially revealed at Summer NAMM 2017 in Nashville, Tenn.
Fender’s popular artist signature models are geared toward product progression and storytelling, creating instruments designed to the unique specifications of the world’s most iconic artists. The Brad Paisley Road Worn®Telecaster® gives fans and players everywhere a chance to engage in a musical experience Paisley helped curate. To learn more about this new artist signature model and his mission to inspire the next generation of players from Paisley himself in the "Fender Presents: Brad Paisley Signature Road Worn Telecaster” video, click here. 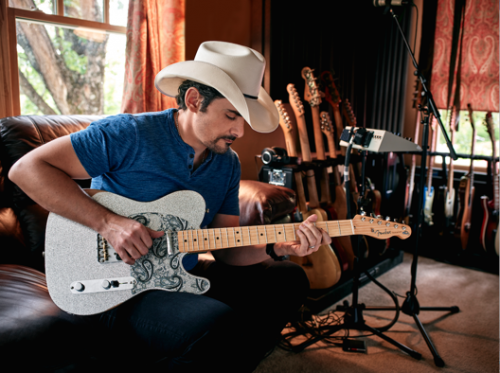 For an approved image of Brad Paisley and his Fender Signature Road Worn® Telecaster® as well as product images please click here. Fender teamed up with Brad Paisley to create his signature model, the Brad Paisley Road Worn Telecaster. The Brad Paisley Telecaster is crafted from a paulownia core capped by a spruce top and back, providing a solid, lightweight foundation with acoustic-like resonance. The Paisley-approved pickup configuration includes a custom-wound ’64 Tele® bridge pickup and a Fender Custom Shop Twisted Tele® neck pickup for classic tone with just the right balance of warmth and twang. Playability is key to Paisley’s fleet-fingered style and the “Enhanced V” neck profile is designed for comfort, filling the hand at the nut for easy chording while flattening out in the upper registers for soloing. The modern 9.5" radius fingerboard and medium-jumbo frets make it easy to play fast and bend big. This Tele wears a silver sparkle Road Worn lacquer finish and aged hardware. Elegant touches include a custom clear pickguard with black and silver paisleys and a cowboy hat insignia on the headstock. Brad Paisley is a critically acclaimed singer, songwriter, guitarist and entertainer whose talents have earned him numerous awards, including three GRAMMYs, two American Music Awards, 14 Academy of Country Music Awards and 14 Country Music Association Awards (including Entertainer of the Year), among many others. He has been a proud member of the Grand Ole Opry since 2001. Paisley has written 21 of his 24 #1 hits including his most recent smash, “Today.” The song has resonated with fans around the globe with the music video garnering over 42 million views, so far. “Last Time For Everything” is his current single from his 11th studio album,LOVE AND WAR, which was released April 21. It is his 9th consecutive studio album to debut #1 on Billboard’s Top Country Albums chart. On April 28 LOVE AND WAR was released as country music’s first ever visual album for a limited time exclusively on Apple Music. Paisley has contributed two instrumental tracks to the Disney·Pixar movie Cars 3, which hit theaters on June 16. Paisley’s 2017 Weekend Warrior World Tour kicked off on May 18 in Saratoga Springs, NY and will continue across the country and across the ocean with shows in Sweden and Norway this summer. Paisley recently partnered with Sarah Cannon, the Cancer Institute of HCA Healthcare, and Sony Music Nashville, by launching 2017 Band Against Cancer. The campaign will spread the word of community-based treatment, options and support. Sarah Cannon has adopted Paisley’s #1 hit “Today” as the campaign’s 2017 theme song. Paisley will return for his 10th year as co-host, with Carrie Underwood, for “The 51st Annual CMA Awards,” airing live on Nov. 8 (8:00 – 11:00pm/et) on the ABC Television Network. Paisley has partnered with Boot Barn® and developed an exclusive line of jeans, hats, T-shirts, jewelry, belts and woven shirts called Moonshine Spirit by Brad Paisley. Connect with Brad at www.BradPaisley.com,www.Facebook.com/BradPaisley, on Twitter @BradPaisley, on Instagram @Brad Paisley, and YouTube at YouTube.com/BradPaisley.